Support for 6Gb/s SAS and SATA hard drives. 16 ports, 4 internal 8087 connectors, PCIe 2.0 x8 interface. 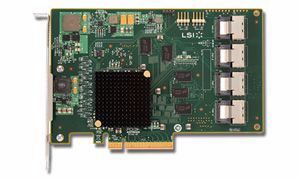 The LSI SAS 9201-16i host bus adapter provides the greatest available throughput to internal server storage arrays through sixteen internal 6Gb/s ports, driving up to 512 SAS and SATA physical devices. This HBA offers dynamic SAS functionality including dual-port drive redundancy and SATA compatibility. The LSI SAS 9201-16i doubles the performance of previous generation SATA+SAS HBAs and is great for driving cost-effective and reliable scalability in today’s data centers.